Triple star system involving a pulsar suggests Einstein was right. It may not be intuitive, but drop a hammer and a feather and – in the absence of air resistance – they will hit the ground at exactly the same time. This is a key principle of physics known as “universal free fall”, stating that all objects accelerate identically in the same gravitational field. In fact, it’s an important theme in Albert Einstein’s immensely successful theory of general relativity, which describes how gravity works. But although we know it holds true for hammers and feathers, it’s been unclear whether the principle extends to extreme objects such as stars. Now a new study, published in Nature, has tested the principle using a remarkably extreme astrophysical environment: a triple star system containing two white dwarfs and a pulsar (a rotating neutron star that beams radio waves). These objects are the extremely dense remnants of dead stars. Spoiler alert: It turns out Einstein is still right, and it is getting even harder to prove him wrong. But let’s start with the basics. Hold an object in your hand. It doesn’t matter what it is – the object will have some mass. We can think of that mass in two ways. Isaac Newton taught us that if we apply a force to a body it will undergo an acceleration, and the size of that acceleration is directly proportional to the amount of force applied – and inversely proportional to the mass itself. Give a broken-down car a push and it won’t accelerate very quickly, but apply that same push to a shopping trolley and you’ll send it careering down the aisle. When thinking about the acceleration of an object due to a force exerted on it, we think about the “inertial mass” of the body. Any two objects with mass are attracted to each other through the gravitational force. So the object you are holding in your hand is attracted to the Earth, and the size of the force pulling it down is dependent on the mass of the object. In this case, we think about the “gravitational mass”. If you dropped it, the object you are holding would “free fall” – the force of gravity would accelerate it towards the ground. The size of the force pulling the object down depends on the gravitational mass, but the amount of acceleration depends on the inertial mass. But is there any difference between the two types of mass? To find out, we can write down an equation of motion linking the two types of mass: inertial mass on one side of the equation and gravitational mass on the other. The equation predicts something we can test using an experiment: if inertial mass is equivalent to gravitational mass, then all objects should fall towards the Earth with an identical acceleration regardless of their mass. That often surprises people. This is called the “Equivalence Principle”. Galileo first noticed that plummeting objects fall at the same rate, and you can do this experiment yourself by simultaneously dropping two objects of different mass. However one problem doing this on Earth is the presence of another force acting on the falling bodies, called air resistance. If you drop a hammer and a feather, the feather will tend to gently drift down to the ground, lagging behind – the objects aren’t strictly in free fall. But go to the moon and do that experiment, as astronaut David Scott did during Apollo 15, where there is no air resistance, and the Equivalence Principle is clear to see. Now, it has been unclear whether the theory does a good job of describing gravity in all situations. There is a lot at stake – if general relativity breaks down for certain situations then we would need a revised or modified theory of gravity. In particular, scientists have been wondering whether the universality of free fall applies to objects that have strong “self gravity” – a significant gravitational field of their own. Indeed some modified theories of gravity predict that the Equivalence Principle might be violated for strongly self-gravitating bodies in free fall, whereas general relativity says it should be universal. Thanks to an extreme laboratory in space – a triple stellar system 4,200 light years away – the new study managed to test this. That name doesn’t do it justice: we’re talking about two white dwarfs and a more massive “millisecond” pulsar (a neutron star rotating about 366 times a second, and beaming radio waves like a lighthouse). One white dwarf and the pulsar are orbiting each other every 1.6 days. In turn they also orbit around the other white dwarf every 327 days. A triple stellar system involving normal stars, similar to the sun. The pulsar-white dwarf pair can be considered to be in free fall towards the other white dwarf, because an orbit is just the case of free fall without ever reaching the ground, like satellites around the Earth. Of course, the pulsar and white dwarf are very massive objects themselves, with strong self gravity. General relativity predicts that the accelerations of the white dwarf and pulsar, due to being in free fall towards the outer white dwarf, should be identical – despite differences in mass and self-gravity. Combining observations that span six years of monitoring, the astrophysicists carefully modelled the orbits of the pair. They measured a parameter called Delta, which describes the fractional difference between the acceleration of the white dwarf and the more massive pulsar. If general relativity holds, then Delta should be equal to zero. The results indicate that, within the uncertainties of the measurements, the difference in accelerations is indeed statistically consistent with zero – we can say with 95% confidence that Delta is less than 0.0000026. This new constraint is far better than anything previously measured. It provides valuable new empirical evidence that general relativity remains our best model of how gravity works, so we are unlikely to need any new or modified theories at this point. This come just weeks after general relativity was proven right on a galactic scale for the first time. Will we ever find a situation where general relativity breaks down? In a way I do hope so, because it would reveal new physics. But the continuing success of general relativity, first written down a century ago, must surely be celebrated as one of the most incredible intellectual achievements of our species. Gold pre-exists the formation of Earth: this is what differentiates it from, for example, diamond. However valuable it may be, this precious stone is born out of mere carbon, whose atomic structure is modified by enormous pressure from the earth’s crust. Gold is totally different – the strongest forces in the earth’s mantle are unable to change the composition of its atomic nucleus. Too bad for the alchemists who dreamed of transforming lead into gold. Yet there is gold on Earth, both in its deep core, where it has migrated together with heavy elements such as lead or silver, and in the planet’s crust, which is where we extract this precious metal. While the gold in the core was already there at the formation of our planet, that in the crust is mostly extraterrestrial and arrived after the formation of Earth. It was brought by a gigantic meteor shower that bombarded the Earth (and the Moon) about 3.8 billion years ago. Two ounces of gold … from outer space. August 17 will remain a major date for the scientific community. 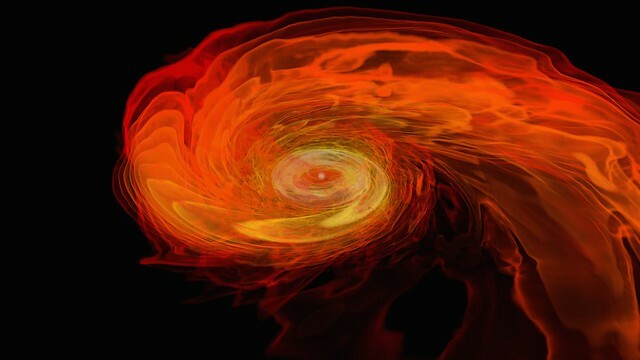 Indeed, it marks the first simultaneous detection of the arrival of gravitational waves – whose origin in the sky was fairly well identified – and a gamma-ray burst, whose origin was also fairly well localized and coincided with the first one. Gamma-ray burst emissions are focused in a narrow cone, and the astronomers’ lucky break was that this one was emitted in the Earth’s direction. In a single observation, the hypothesis that prevailed until now – of a r process occurring exclusively during supernovae – is now seriously under question and it is now certain that the r process also takes place in kilonovae. The respective contribution of supernovae and kilonovae for the heavy elements’ nucleo-synthesis remains to be determined, and it will be done with the accumulation of datum related to the next observations. The August 17 observation alone has already allowed a great scientific advance for the global understanding of the origin of heavy elements, including gold. A new window to the universe has just been opened, like the day that Galileo focused the first telescope on the sky. The Virgo and LIGO interferometers now make it possible to “hear” the most violent phenomena of the universe, and immense perspectives have opened up for astronomers, astrophysicists, particle physicists and nuclear physicists. This scientific achievement was only possible thanks to the fruitful collaboration between highly supportive nations, in particular the United States, Germany, France and Italy. As an example, there is only one laboratory in the world capable of reaching the required precision for the mirrors reflecting lasers, LMA in Lyon, France. New interferometers are under development in Japan and Indian, and this list will surely soon become longer given huge discoveries expected for the future.